China says it has written off almost $78m (£60m) from Cameroon’s debt as part of measures to ease economic hardship in the central African nation, but analysts say it is a play for greater access to resources. The debt relief announcement was made on Friday shortly after a meeting between President Paul Biya and Yang Jiechi, a special representative of China’s President Xi Jinping. 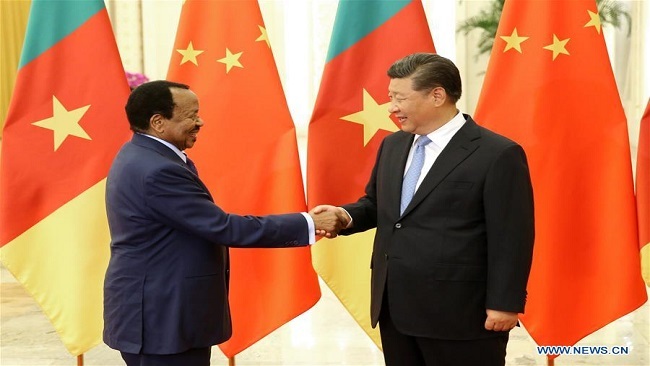 Cameroon’s total debt burden to China stands at almost $5.7bn (£4.4bn), according to figures from the Autonomous Sinking Fund, the public entity that manages Cameroon’s external debt. The sum of $78m that has been wiped is money that should have been paid in 2018, but which Cameroon failed to pay. Instead, the country’s president flew to China for the third Summit of the China-Africa Cooperation in September and pleaded with Chinese authorities to ease Cameroon’s debt burden. Cameroonian economist Ariel Gnitedem says the amount cancelled looks paltry in comparison with the total debt, and says it could actually be for China’s long-term benefit. “China wants to control the sub-regional market and Cameroon is the gateway,” he told the BBC. Cameroon has been contracting loans from China to build dams, roads, hospitals and other infrastructure.